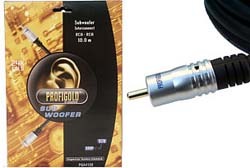 Profigold PGD4000 Oxypure 0.75m digital audio interconnect. Enjoy the ultimate sound experience with this top of the range interconnect. Features New generation material. 99.9997% pure single crystal OCC copper. Revolutionary sound performance. Double shielding: 2 x braiding plus conductive PVC. Air foam PE insulation. Twist and lock connectors provide the ultimate connection. Copper alloy RCA/Phono pins 24k Gold Plated contacts ensure optimum signal transfer. Silver soldered connectors for the lowest loss. Lifetime limited warranty against defects or workmanship. Supplied in Profigold retail presentation box.